If you take an analytical drill and you start drilling into this Republican campaign and you drill down through this [47%] quote and you drill down through voter ID, where you hit bedrock is, I think, an age-old conservative skepticism of democracy. With more than 96,000 views so far, The Distress of the Privileged has brought a lot of new people to this blog. I hope some of you bookmarked it and have come back to see what a typical week is like. Here are some of the posts from recent weeks that you might find interesting: My Paul Ryan triology (1, 2, 3), Five Pretty Lies and the Ugly Truths They Hide, How Lies Work, and The Economics of Leviticus. Now on with the usual Sift. I’ll bet he wishes he’d really said that and then stopped. What’s disturbing in the quote, though, is that (i), (ii), and (iii) can swap in and out interchangeably in one paragraph. This is the Makers vs. Takers line that Paul Ryan has pushed in the past: The country is more-or-less evenly divided between the productive (who work hard and vote Republican) and the lazy (who expect the government to take care of them and vote Democrat). You will run into this view often if you cruise through conservative blogs like RedState or read the comments on Washington Times or Fox News articles. Romney’s mistake was that he got caught on tape repeating common conservative locker-room talk. A Republican ideology pitting the “makers” against the “takers” offers nothing. No sympathy for our fellow citizens. No insight into our social challenge. No hope of change. … Politics is reduced to class warfare on behalf of the upper class. Paul Ryan has it perfectly backwards when he talks about makers and takers. This nation’s makers are the workers. The makers are the people who work for a living, with their hands, in the field, teaching, building, repairing, healing, growing (to name a few) and, yes, drilling and mining, even typing and filing. … The takers are the financiers, who no longer serve primarily to help develop industries and communities here in this country. The takers are the bankers like Mitt Romney who shuffle investments, frequently in fraudulent fashion, around the world and build only their own fortunes while otherwise playing at best a zero-sum game of job-shifting from one country to another. The highlight is that Romney paid 14.1% of his income in taxes, but only because his accountants engineered his return to uphold his statement that he never paid less than 13%. They didn’t claim all of the charitable-giving deduction he was entitled to. But if he decides to file an amended return after the election (who’ll know?) he can get his rate down to 12.2%. Is even 14.1% a lower rate than most Americans pay? Depends on how you figure. If you just count income tax, no. But if you also count payroll taxes — which Romney doesn’t pay because he doesn’t earn wages — then FactCheck.org reports that the median 20% of taxpayers pay a 15.5% tax rate. 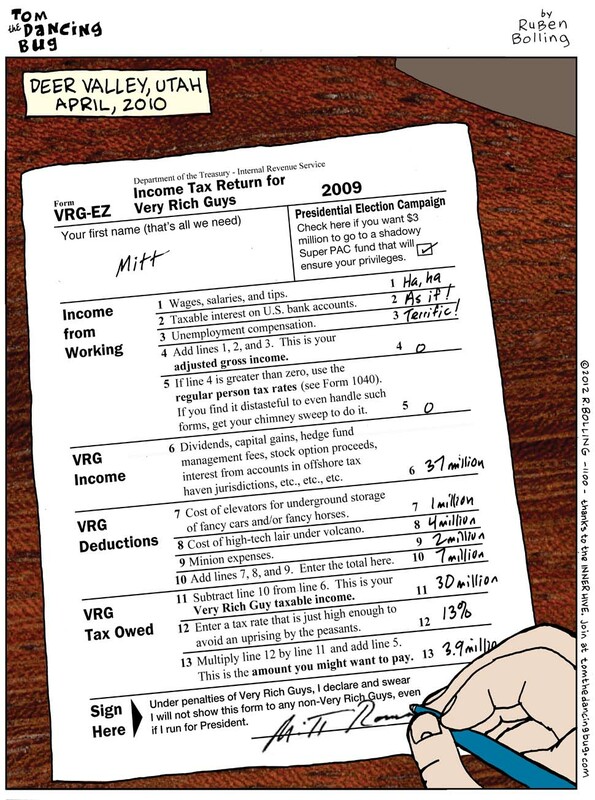 Romney’s accountants claim he has paid at least 13% in each of the last 20 years. But since the pre-2010 returns are still secret, they can claim anything they want. The end result satisfies no one. He’s claiming that 14.1% isn’t shameful, but acting as if 12.2% would be. It’s hard to find a coherent position in that. For the most part, President Obama has been happy to leave Romney twisting in the spotlight. But I’ve been predicting for a while that Obama will end his campaign by making a positive case for his own re-election, while Romney will stay negative to the end. Here’s my version of Obama’s Positive Case. The Chicago teacher’s strike gave me an excuse to watch Waiting for Superman and read Steven Brill’s pro-reform book Class Warfare. I wanted to be convinced, but I wasn’t. Maybe sending Paul Ryan to talk to the AARP wasn’t such a great idea. On 60 Minutes last night, Mitt Romney repeated one of the Five Pretty Lies I identified a few weeks ago: The uninsured can get the health care they need in the emergency room. A phrase that needs to catch on: Plutocratic Insurgency. You know who hates the new way scientist picture dinosaurs? Creationists. Good put up. I discover 1 factor far more difficult on totally unique blogs everyday. It ought to at all periods be stimulating to research articles from unique writers and stick to a little little bit some factor from their store. I’d desire to work with some together with the written content materials on my weblog no matter if or not you don’t head. Natually I’ll provide you with a web site link on your web weblog. Thanks for sharing.